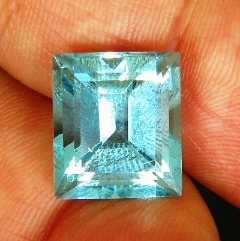 Comment: Massive aquamarine in a simple but most unique cut that makes it hard to visualize on photo. Best to study the side-images and the hand shots first, always ignoring the skin structures on the latter except for proof of a fine crystal. 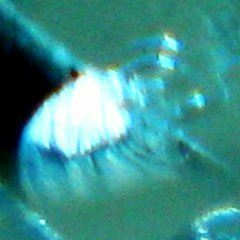 The one inclusion that is visible under the lens I have captured in a close-up. 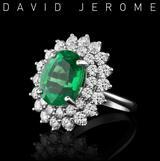 The rest of the gem is so clean that, in a near 10 carat gem, the grade 'lightly included' is very harsh. 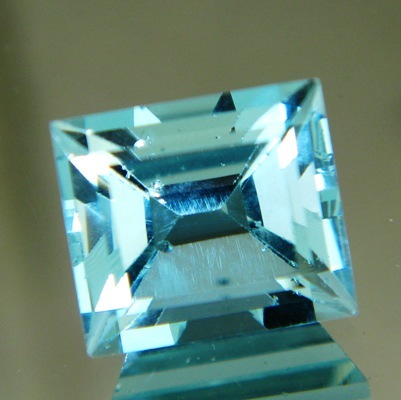 Strong shiny blue, almost paraiba-like, with a tint of green. Obviously it was cut to show off its colour but it can also be mirror-like brilliant (not with the sparkle of dozens of facets, of course, but with a full reflection of light). 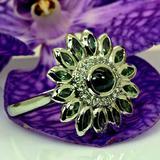 One-only gem for a designer pendant. No treatments, DSEF certified, no window, no inclusions (except that spider on the image).